Screen recordings are a great resource! Sending us a recording of your screen is the best way to provide one of our Happiness Engineers with information needed to make sure you get the best help. 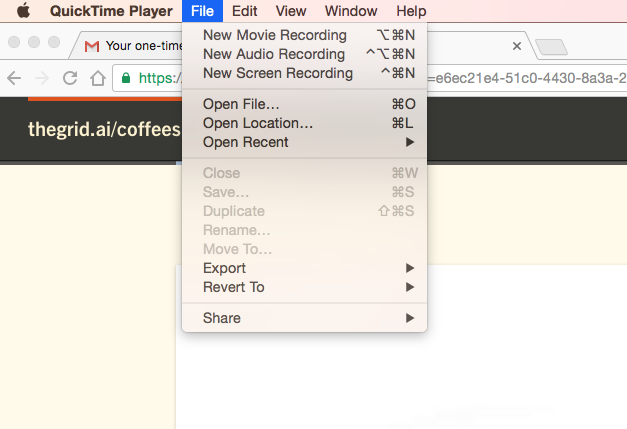 First, open QuickTime and select "New Screen Recording". You can do this from the top menu as shown, or by right clicking the Quicktime icon in your Dock. This will bring up the console pictured below. Click on the down arrow next to the record button. Make sure that you have your audio settings and "Show Mouse Clicks in Recording" checked. Speaking your thoughts aloud as you navigate The Grid and displaying your mouse clicks will help us make sure that we're getting all we need from you to make The Grid awesome! Press the red Record button. Then, choose to record the entire screen, or you can drag to record just a selected portion of the screen of your choosing. After you click "Start Recording" you'll be off and running to make your video. Once you're done, it's time to get that film in the can! Click the QuickTime icon in your dock and then select "Stop Screen Recording". The video you recorded will automatically open so that you can title and save it. Thanks for making a screen recording! Please share it with us by uploading it to youtube, vimeo, google drive, dropbox or whatever service you prefer. If you'd like it to be private, make sure to put a password on it and let us know what it is. Thanks for helping us build The Grid!